Today, a homeowner on Sugarloaf Key working on storm damage in his house at 11 a.m. spotted what looked like a porpoise stranded in some mangroves on a flat offshore. He called to report it to the Monroe County Sheriff's Office. 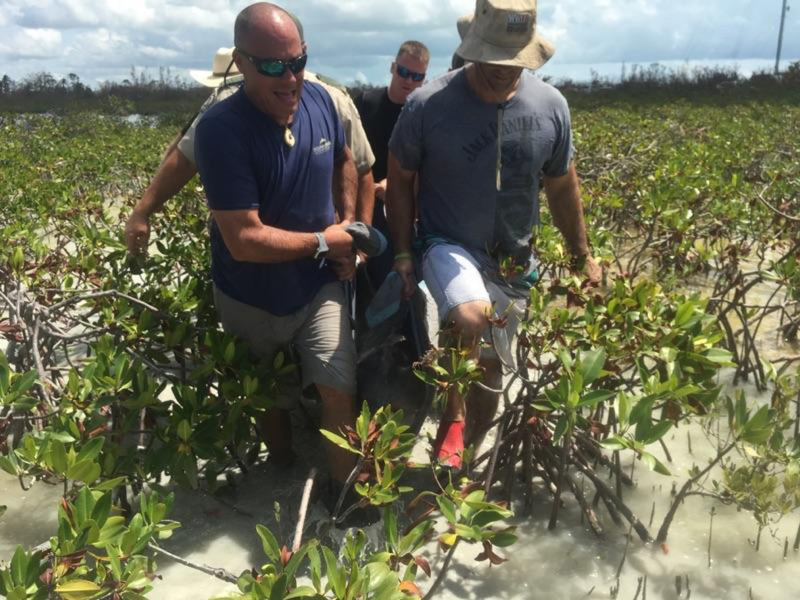 Sheriff's deputies, Fish and Wildlife Conservation Commission officers, Veterinarian Dr. Doug Mader and Brandon Paquin from Dolphins Plus sprang into action. They waded out to the stranded female and carried her to deeper water where she swam away. Dr. Mader, who owns Marathon Veterinary Hospital, said it appears she had not been stranded too long because she only had minor sunburn visible on her skin. He is hopeful she will be fine, however if she had remained there long she may have suffered much more sun damage. Mader thinks perhaps she washed in with one of the recent very high tides in the area.